Happy New Year! As we all work to stick to our New Year’s resolutions, the FACT Board of Directors is planning to set its goals at its retreat in April of this year. In addition to refining the new initiatives we launched within the past year, we have great momentum to continue making a difference in new and exciting ways. As we plan our retreat, please feel free to offer suggestions about objectives we should consider over the next three years. As we set new goals, we also need to keep focus on maintaining the foundation we have built as an accrediting organization. One of the most important roles in our program is that of the inspector. As the number of FACT-accredited programs increases, our needs for inspectors increase. If you are already an inspector, please make a New Year’s resolution to perform at least two inspections in 2017. If you are interested in becoming a new inspector, we want to hear from you. Apply online at www.factwebsite.org. Last, but definitely not least, I am pleased to announce that the FACT Standards for Immune Effector Cells has been published, along with immune effector cell-related interim standards as part of the FACT-JACIE International Standards for Hematopoietic Cellular Therapy Product Collection, Processing, and Administration. We are excited to learn new things from immune effector cell programs and help make this therapy a high-quality option for more patients. I wish you a happy, healthy, and joyous new year. 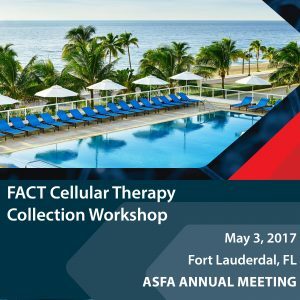 Through the work of the Immune Effector Cell Task Force, led by Co-Chairs Dr. Helen Heslop, Dr. EJ Shpall, and Dr. Michael Lill, FACT has published interim standards for the sixth edition FACT-JACIE International Standards for Hematopoietic Cellular Therapy Collection, Processing, and Administration. The interim standards are intended to promote quality in administration of immune effector cell products, such as chimeric antigen receptor T cells (CAR-T cells), natural killer cells, virus-specific T cells, therapeutic cellular vaccines, and others. The requirements primarily highlight unique aspects of administration and toxicities of immune effector cells. These requirements will become effective on March 1, 2017. All FACT-accredited cellular therapy programs that administer immune effector cells must be in compliance with the new standards by this date. If you have any questions, contact the FACT office at fact@unmc.edu. The updated Standards, accompanying Accreditation Manual, and summary of changes are available on the FACT website for reference. Printed copies of the Standards and Accreditation Manual may be purchased from the FACT store. The first edition of the FACT Standards for Immune Effector Cells has been published. These Standards apply to immune effector cells used to modulate an immune response for therapeutic intent, such as dendritic cells, natural killer cells, T cells, and B cells. This includes chimeric antigen receptor T cells (CAR-T cells) and therapeutic vaccines. Transplant programs that also administer immune effector cell programs should refer to the FACT-JACIE Hematopoietic Cell Therapy Standards for a complete set of requirements pertaining to both HPC transplant and immune effector cells. (Compliance with the immune effector cell standards by March 1, 2017 is required of FACT-accredited programs performing this type of therapy.) Stand-alone immune effector cell therapy programs should reference the FACT Immune Effector Cell Standards. Applications for accreditation of these programs will be accepted in February. More details will be forthcoming. In the meantime, a self-assessment tool is available to help stand-alone programs prepare. The scope of the Standards includes donor selection and management, administration of cells, management of adverse events, and evaluation of clinical outcomes. The Standards require a quality management (QM) program that establishes, maintains, monitors, and implements improvements in the quality of facilities, processes, and performance. These Standards were prepared under the assumption that some programs will be responsible for collection and processing of immune effector cells. Regardless of where the product comes from, the program must meet clearly defined responsibilities for chain of custody, storage, verification of product identity, and management of adverse events. In so far as a program is responsible for collection of cells, manufacturing of the cellular therapy product, or preparing the product for administration, the collection and processing requirements in the FACT Immune Effector Cell Standards apply. 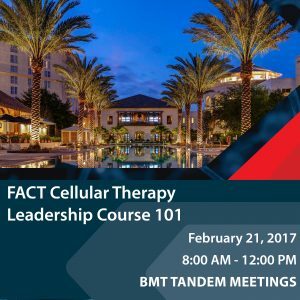 FACT celebrated its 20th year as the leading organization in standards setting and accreditation for cellular therapy, hematopoietic stem cell transplantation, and regenerative medicine. FACT welcomed visitors to a dynamic exhibit booth at the BMT Tandem Meetings and the ISCT Annual Meeting to celebrate with the organization. Attendees who wore their commemorative FACT 20th anniversary pin received gifts and were entered in a daily drawing for prizes. 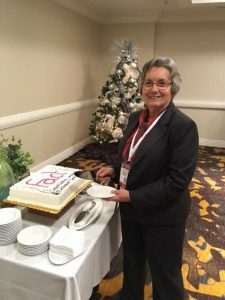 FACT also hosted anniversary receptions at these meetings, and many FACT colleagues, volunteers, and friends enjoyed hors d’oeuvres and refreshments as FACT celebrated two decades of working together in the community to improve patient care and safety. Guests enjoyed watching a short video highlighting FACT’s past 20 years, and saw some familiar faces who have been an integral part of FACT since its beginning. The corrective action plan must identify specific causes of death. The corrective action plan must provide quantitative data. The assessment must identify reasonable causes of the low one-year survival rate. The corrective action plan must address the identified causes. There must be a measurable outcome improvement. The program must provide updates on corrective actions at the time of inspection, at the time of annual reporting, or as otherwise directed by the committee. FDA should fulfill its responsibilities to protect patients in search of cellular therapies. FACT supports its parent society, the International Society for Cellular Therapy (ISCT), in its position on unproven therapies and agrees on the importance of providing adequate education for patients. Development of professional standards and voluntary accreditation can play an important role in providing a bridge from basic research to clinical application. The tiered unified approach to HCT/P regulation fails to acknowledge the complexity of some tissues with multiple native functions and many cell types. It is difficult to strictly categorize complex tissues such as adipose tissue as only structural or cellular. Dr. Warkentin offered solutions for applying regulations to such tissues. There appear to be some inconsistencies in the definitions and examples of homologous use that would benefit from clarification. FACT suggests that the Agency expand upon its expectation for cord tissue, to include which regulations apply and when they apply, based upon the processes in place. International harmonization is important to facilitate product development and world-wide availability of cell-based therapies for patients. NetCord and FACT published the 6th edition NetCord-FACT International Standards for Cord Blood Collection, Banking, and Release for Administration and its accompanying Accreditation Manual on July 1, 2016. These Standards became effective after 90 days, and all accredited cord blood banks were required to comply with the requirements by that time. These Standards cover 1) collection of cord blood cells, regardless of the methodology or site of collection; 2) screening, testing, and eligibility determination of the maternal and infant donor according to Applicable Law; 3) all phases of processing, cryopreservation, and storage, including quarantine, testing, and characterization of the cord blood unit; 4) making the cord blood unit available for administration, either directly or through listing with a search registry; 5) the search process for selection of specific cord blood units; 6) reservation and release of cord blood units for clinical use; and 7) all transport or shipment of cord blood units, whether fresh or cryopreserved. FACT published a draft of the 1st edition FACT Standards for Immune Effector Cells for inspection and public comment in July 2016. Interim standards for the 6th edition FACT-JACIE International Standards for Hematopoietic Cellular Therapy Product Collection, Processing, and Administration were also proposed to include immune effector cell programs within blood and marrow transplant units. These Standards are intended to promote quality in administration of immune effector cells and will be incorporated into a voluntary FACT accreditation in this field. The Standards apply to immune effector cells used to modulate an immune response for therapeutic intent, such as dendritic cells, natural killer cells, T cells, and B cells. This includes chimeric antigen receptor T cells (CAR-T cells) and therapeutic vaccines. Commenters included, among others, pharmaceutical companies, the FDA, the American Society of Cell & Gene Therapy (ASGCT), and the Society for Immunotherapy of Cancer (SITC). A total of 131 comments were received, and reviewers generally expressed support for the Standards and posed worthy questions to consider. CYCORD Public Allogeneic Cord Blood Bank in Cyprus received internationally recognized FACT accreditation. CYCORD, directed by Paul Costeas, PhD, is the first and only cord blood bank in Cyprus to be recognized by FACT. The bank received accreditation on June 13, 2016, and is accredited for banking cord blood for both public and private family use. Universidad Autónoma de Nuevo León, Servicio de Hematología Hospital Universitario in Mexico received internationally recognized FACT accreditation. Universidad Autónoma de Nuevo León, Servicio de Hematología Hospital Universitario, directed by David Gomez-Almaguer, MD, is the first and only cellular therapy program in Mexico to be recognized by FACT. The program received accreditation on September 6, 2016, and is accredited for Adult and Pediatric Allogeneic and Autologous Hematopoietic Progenitor Cell Transplantation, Peripheral Blood Cellular Therapy Product Collection, and Cellular Therapy Product Processing. StemCyte India Therapeutics Cord Blood Bank, directed by Bhavin Kapadiya, MD, is the first and only cord blood bank in India to be recognized by FACT. The bank received accreditation on December 21, 2016, and is accredited for banking cord blood for both public and private family use. 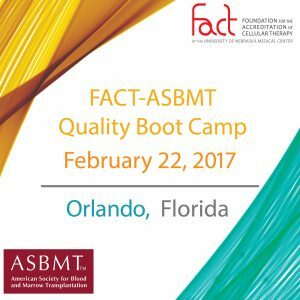 FACT hosted a Quality Boot Camp at the annual meeting of the American Society for Blood and Marrow Transplantation (ASBMT). The goal of the boot camp program is to strengthen quality assurance activities through pre-meeting exercises and an in-person workshop. Members of the FACT Quality Committee encouraged registrants in the months leading to the in-person workshop to review specific aspects of their quality programs. Quality experts then presented important concepts and led roundtables that allowed participants to ask questions and help each other reach their goals during the boot camp. FACT also partnered with ISCT at their regional meeting to co-host sessions in the Quality and Operations Track. Presentations focused on outcome analysis from the processing perspective and the anatomy of an audit. FACT and the American Society for Histocompatibility (ASHI) began collaborating to offer webinars on transplant immunology. Establishing best practices in transplant immunology in different parts of the world requires both deep understanding of the unique challenges that face different parts of the world, and building on the experiences of well-established labs and international histocompatibility professional societies. The Advancing Standards in Regenerative Medicine Act directs the Secretary of the United States Health and Human Services Agency to establish a public-private Standards Coordinating Body in Regenerative Medicine and Advanced Therapies. The Standards Coordinating Body (SCB) includes membership of the entire cross-section of regenerative medicine stakeholders. FACT was pleased to join as a charter member, and will organize its efforts as part of a consortium of non-government stakeholders that seeks to partner with one or more government organizations and regulatory agencies to coordinate consensus standards development efforts. More specifically, the SCB seeks to enable more efficient and successful clinical and commercial development of cellular/gene and regenerative medicine therapies through coordinating and prioritizing development of national/international standards for measurement assurance (among other objectives). The FACT Board of Directors approved its updated appointments in December, which became effective January 1, 2017. We thank these volunteers for their time and dedication to direct the activities of FACT. We are confident in their ability to continue leading FACT as a peer-driven organization that is adaptable to the needs of its constituents. Board members consist of representatives of FACT’s parent organizations, The American Society for Blood and Marrow Transplantation (ASBMT) and the International Society for Cellular Therapy (ISCT). ASBMT reappointed Mark Litzow, MD and Kimberly Kasow, DO to the Board, and ISCT reappointed Ngaire Elwood, PhD. ISCT appointed Abba Zubair, MD, as its new representative. The Board also approved expanding its composition to include a seat for a member appointed by the American Society of Apheresis (ASFA), and the nomination process is underway. 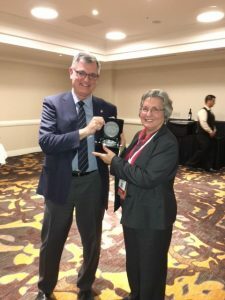 During its meeting at the ASH Annual Meeting in December 2016, the FACT Board of Directors honored Carolyn Taylor, PhD, for her many years of service and wished her congratulations on her upcoming retirement. Presenter/FACT representative at countless in-person and online events. FACT and the cellular therapy community would not be what they are today without the time, expertise, and counsel Dr. Taylor selflessly gave to others. We wish her the fulfilling and enjoyable retirement that she deserves, and will appreciate the impact she had on our field for years to come. NetCord, the organization of leading cord blood banks and FACT’s partner in cord blood standards and accreditation, has joined with the World Marrow Donor Association (WMDA). Its activities will be incorporated into an expanded working group within WMDA that will take on NetCord’s important work. The working group’s new mission statement will be, “To support, promote and enhance safety, efficacy and availability of international exchange of cord blood units and to harmonize global practice of cord blood banking and supply.” It is also expected that this will enhance the cord blood community’s ability to focus on cellular therapy from cord blood products. 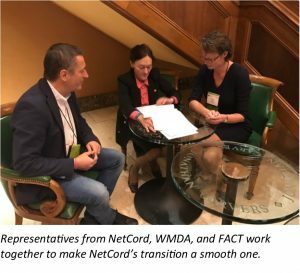 Together, NetCord and WMDA will continue the strong leadership position carved out by NetCord in cord blood banking, with its abilities strengthened by the support of the WMDA. By joining WMDA, there will be a more efficient use of volunteers and their time, and require less overhead expenses. Within the working group, NetCord’s members will continue to support the NetCord-FACT International Standards for Cord Blood Collection, Banking, and Release for Administration and make accreditation decisions based on those Standards. Gesine Kögler, PhD, will serve as the official liaison to FACT. Dr. Kögler is a long-time member of the FACT Standards and Accreditation Committees. More details will be shared with the FACT community as they become available. 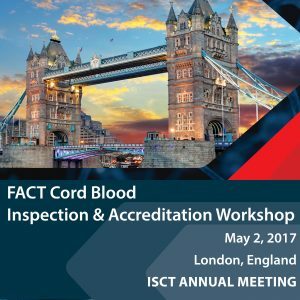 Dr. Kögler will give a presentation on the new relationship between NetCord and WMDA at the FACT Cord Blood Inspection & Accreditation Workshop at the ISCT Annual Meeting in London on May 2, 2017. The interorganizational Donor History Questionnaire materials have been updated to reflect recommendations made by the FDA’s Guidance for Industry: “Revised Recommendations for Determining Eligibility of Donors of Human Cells, Tissues, and Cellular and Tissue-Based Products Who Have Received Human-Derived Clotting Factor Concentrates,” published in November 2016. The Donor History Questionnaire (DHQ) materials were developed to screen allogeneic HPC donors for communicable disease risk factors in accordance with requirements of the Food and Drug Administration (FDA), AABB, FACT, and the National Marrow Donor Program (NMDP). The FDA does not mandate use of any particular tool to fulfill donor screening requirements for communicable disease risks and has determined that “official” recognition of DHQ materials in a guidance document is not warranted. The task force believes the DHQ materials, which are harmonized with applicable regulations and guidance documents, will optimize donor comprehension of the questions and provide donor historians with the tools needed to evaluate donor responses. Facilities should read the “User Instructions” carefully before adopting the materials for use. When a facility implements a new version of these DHQ materials, it should follow its established change control process for the incorporation of the new DHQ materials. The change control process should address validation of the use of the new version with other existing processes and appropriate staff training. On-site inspections are understandably stressful experiences. Organizations essentially invite others to come to their sites, look through their documents, watch their work practices, and record observations. Organizations that voluntarily pursue FACT accreditation want to do well, and it is natural to feel nervous about what inspectors may find while assessing their programs. When preparing documentation for inspector review, it may be instinctively enticing to avoid showing inspectors everything. Limiting what inspectors see limits the amount of deficiencies they find, right? Wrong. Although it seems counterintuitive, more citations result from inspectors not able to find evidence of compliance. Do not think of an inspection as a day to avoid doing anything wrong. Think of it as a day to proudly show all that your program has accomplished! The easier it is for inspectors to find and review documents, the easier it is for them to check “Compliant” on that ubiquitous inspection checklist. Showing documentation upfront on the day of inspection will avoid extra time and effort to describe the documentation when responding to deficiencies afterward. Therefore, be ready to show inspectors audits, adverse event investigations, and urgent medical need documentation for ineligible donors. The purpose is not to show the inspectors any shortcomings; the purpose is to show inspectors your approach to quality management and continuous improvement. Organizations that act like they have something to hide will appear to have something to hide. Confidently showing inspectors your quality documents, procedures, and investigations demonstrates a commitment to quality. FACT and its inspectors want organizations to do well, and that does not end with an accreditation certificate. The ultimate goal of FACT accreditation is to continuously improve. The more you show us, the more we will be able to help you and the better value you gain from the accreditation process. The FACT-JACIE Hematopoietic Cell Therapy Standards state, “If the intended recipient has received high-dose therapy, the cellular therapy product shall be transported.” (CM10.3.2, C10.3.2, D10.7) Some have asked what the purpose of this standard is because a product always needs to be distributed to the recipient. The key word in this standard is “transported.” As stated by the FACT-JACIE definitions in Part A of the Standards, “transport” is the physical transfer of a cellular therapy product within or between facilities during which it does not leave the control of trained personnel at the transporting or receiving facility. In other words, someone who is trained to transfer a product must be with it at all times. This is in contrast to shipping, during which the product does leave the control of trained personnel (such as shipment on a commercial distributing company’s truck or airplane). If a patient has undergone high-dose marrow ablative treatment in preparation for transplant, the cellular therapy product is essential for the patient’s survival since it may not be possible to obtain additional marrow or blood from the original donor or a second donor in time to prevent complications from aplasia. For this reason, it is important that the product be entrusted to a knowledgeable individual who accompanies it from the distributing facility to the receiving facility. The following individuals completed their first active inspection from April 2016 through December 2016. Congratulations and thank you for volunteering your time and expertise to advance cellular therapy! Organizations with personnel who also serve as FACT inspectors typically perform better during on-site inspections than their counterparts without an inspector. If you are interested in serving as an inspector, submit an online application! 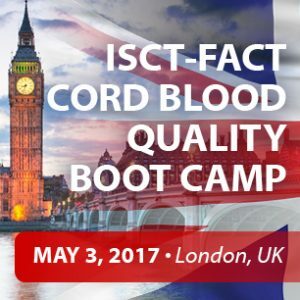 This year’s destination event for cord blood banks will be at the 2017 ISCT Annual Meeting in London. Two days prior to the meeting, leading cellular therapy organizations will convene to provide education to cord blood banks in one convenient location. Plan to attend this one-stop opportunity to learn from FACT, CBA, ISCT, ASBMT, and world-renowned cord blood scientists and transplant physicians. NetCord’s integration with the WMDA; Challenging requirements for cord blood banks including cryopreservation, stability studies, and root cause analysis; and Requirements for FACT inspectors, including new inspector orientation. Would you like to attend the workshop for FREE? Apply to be a FACT inspector. Approved inspectors attend educational activities at no cost. View meeting details and register at factwebsite.org. The boot camp will strengthen participants’ quality assurance knowledge through pre-meeting exercises and an in-person workshop. Members of the FACT Quality Committee and the ISCT Planning Committee encourage everyone to review specific aspects of their cord blood banks’ quality program in the months leading up to the boot camp. During the boot camp, quality experts will present important concepts and lead roundtables where participants may ask questions and help each other reach their goals. Participants are strongly encouraged to register early and participate in the pre-conference assessment activities. Be sure to register for the boot camp AND complete the pre-conference informational survey. 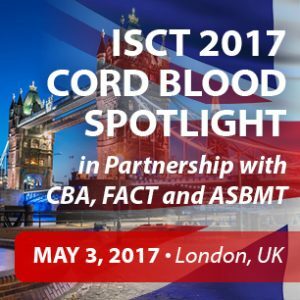 ISCT and the CBA, in partnership with ASBMT, are pleased to host the third Cord Blood Series as part of the Pre-Conference Day at ISCT 2017. Join Dr. Joanne Kurtzberg and Dr. Elizabeth J. Shpall for a full day of presentations and discussions with key leaders in the field about topics ranging from cell engineering to immunotherapy, and beyond. This webinar will be on February 8, 2017, at 11:00 AM ET. This virtual roundtable will consist of three accredited organizations (including both cellular therapy programs and cord blood banks), who will share how they improved outcomes. Presenters will describe how they analyzed outcomes, what issues they found, and what they did to improve. The blood and marrow transplant field has been a leader in voluntarily improving quality, and accredited Clinical Programs are currently adapting to several new FACT Standards and procedural changes to the accreditation process. This workshop will provide background on these changes. The morning workshop sessions include major topics such as clinical outcomes benchmarking, joint FACT/CIBMTR data audits, and immune effector cell requirements. FACT will also present information on the New FACT Accreditation Portal and demonstrate the overall application workflow for applicants and inspectors. The afternoon session includes two different tracks: Accreditation Process and Standards. The Accreditation Process track includes sessions on the FACT accreditation process, being prepared on inspection day, trainee inspector orientation, and demonstrating compliance on inspection day. The Standards Track will highlight 6th edition common citations, outline donor management issues, clarify the 6th edition continuing education requirements, and discuss coordination of care. Sessions are accompanied by exercises and group discussions to practically apply lecture concepts to real-world experiences. Note: Inspector trainees are required to attend all four sessions in the Accreditation Process track. All other applicants may choose which sessions to attend in the afternoon and are encouraged to attend sessions in both tracks as they fit educational needs. In years past, participation in FACT’s leadership workshop has been by invitation. The course is open to anyone who has (or aspires to) a leadership position in cell therapy – whether you direct a transplant center or laboratory, lead a cell collection service or cord blood bank, head a staff of nurses or transplant coordinators, hold an office or board position in a volunteer organization, chair a committee, or have any position in which you are expected to motivate and lead a team. 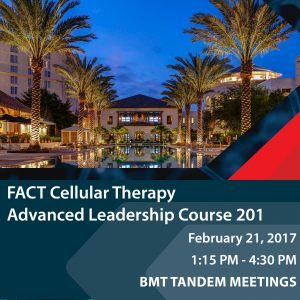 Join us for the FACT-ASBMT Quality Boot Camp at the 2017 BMT Tandem Meetings on February 22 in Orlando, FL. This year’s boot camp will expand upon last year’s core topics by bringing a unique perspective and new examples that will pertain to clinical programs. The boot camp will strengthen your quality assurance activities through pre-meeting exercises and an in-person workshop. 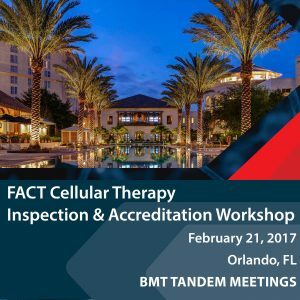 Members of the FACT Quality Committee and the ASBMT Administrative Directors SIG Quality Working Group will encourage you in the months leading up to the BMT Tandem Meetings to review specific aspects of your quality program. Quality experts will then present important concepts and lead roundtables that allow participants to ask questions and help each other reach their goals during the boot camp. Participants are strongly encouraged to register early to participate in the pre-conference assessment activities. Each month prior to the in-person meeting, registrants will receive a short survey that will encourage them to asses a quality management principle as it relates to their organizations (answers can be submitted anonymously if desired). The Quality Boot Camp will be designed around the challenges and successes illustrated by the results provided by registrants. Participants are also welcome to bring specific documents and questions to the meeting for advice. Note: There is a nominal charge of $50 to cover catering for attendees. Introductory FACT accreditation portal training courses are open to applicants and inspectors who will use the New FACT Accreditation Portal. FACT’s IT Business Analyst will provide hands-on training of the system interface and demonstrate the overall workflow. There are two training sessions for applicants and two for inspectors. FACT asks that you bring a fully-charged laptop to your session. Free Wi-Fi will be available. Sign up now to reserve your spot! This webinar will take place on March 1, 2017, at 11:00 AM ET. Dr. Gesine Kögler of the José Carreras Cord Blood Bank in Düsseldorf, will give an overview of the explicit specifications for CB units released for unrelated administration pertaining to the FACT 6th Edition Cord Blood Standards. This webinar will be on March 15, 2017, at 11:00 AM ET. Sue Armitage, BSc, will discuss the how family cord blood banks can comply with the NetCord-FACT 6th Edition Cord Blood Standards, methods to overcome challenges, and the benefits to achieving FACT accreditation. ~ Requirements for FACT inspectors, including new inspector orientation. Would you like to attend the workshop for FREE? Apply to be a FACT inspector! If you are approved, you can attend free of charge! The boot camp will strengthen participant’s quality assurance knowledge through pre-meeting exercises and an in-person workshop. Members of the FACT Quality Committee and the ISCT Planning Group encourage everyone to review specific aspects of their cord blood banks’ quality programs in the months leading up to the boot camp. During the boot camp, quality experts will present important concepts and lead roundtables where participants may ask questions and help each other reach their goals. Participants are strongly encouraged to register early and participate in the pre-conference assessment activities. Be sure to register for the boot camp AND complete the pre-conference informational survey.